In this study, we identify transmembrane protein 131–like (TMEM131L) as a novel regulator of thymocyte proliferation and demonstrate that it corresponds to a not as yet reported inhibitor of Wnt signaling. Short hairpin RNA–mediated silencing of TMEM131L in human CD34+ hematopoietic progenitors, which were then grafted in NOD-SCID/IL-2rγnull mice, resulted in both thymocyte hyperproliferation and multiple pre– and post–β-selection intrathymic developmental defects. 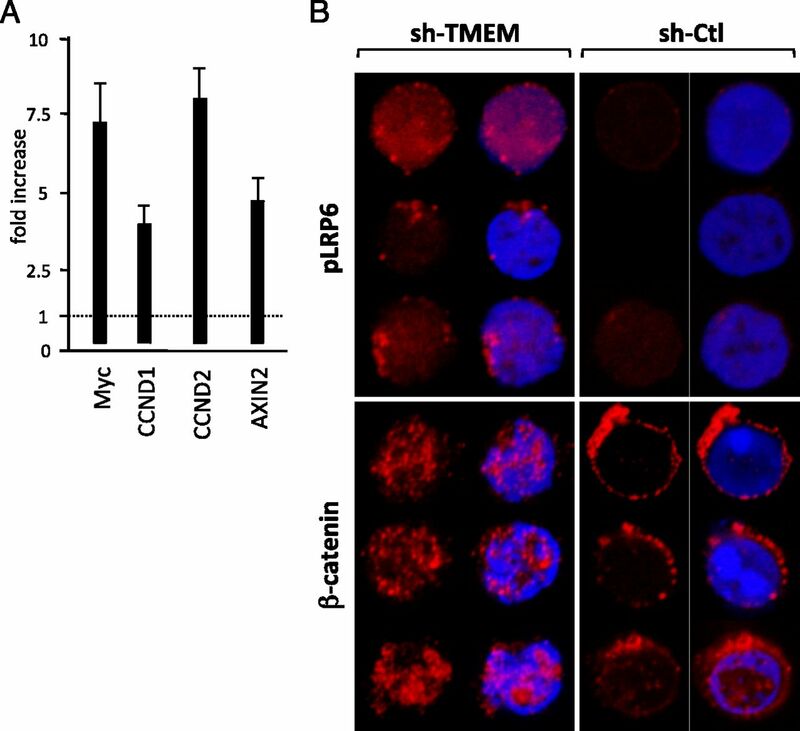 Consistent with deregulated Wnt signaling, TMEM131L-deficient thymocytes expressed Wnt target genes at abnormally high levels, and they displayed both constitutive phosphorylation of Wnt coreceptor LRP6 and β-catenin intranuclear accumulation. Using T cell factor reporter assays, we found that membrane-associated TMEM131L inhibited canonical Wnt/β-catenin signaling at the LRP6 coreceptor level. Whereas membrane-associated TMEM131L did not affect LRP6 expression under basal conditions, it triggered lysosome-dependent degradation of its active phosphorylated form following Wnt activation. Genetic mapping showed that phosphorylated LRP6 degradation did not depend on TMEM131L cytoplasmic part but rather on a conserved extracellular domain proximal to the membrane. 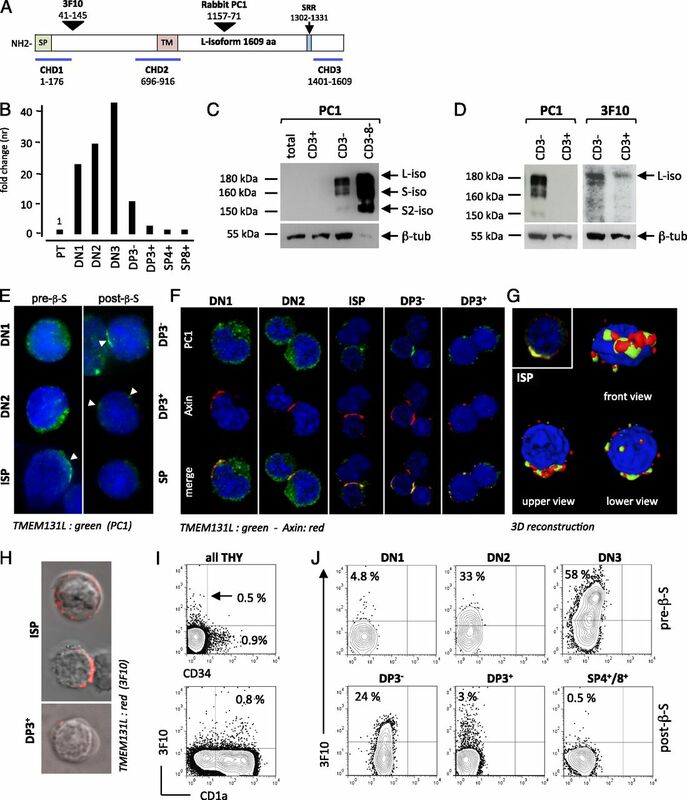 Collectively, these data indicate that, during thymopoiesis, stage-specific surface translocation of TMEM131L may regulate immature single-positive thymocyte proliferation arrest by acting through mixed Wnt-dependent and -independent mechanisms. Following extravasation from the blood, early thymus immigrants establish lymphostromal synapses with cortical thymic epithelial cells, which triggers proliferation and drives their specification along the T cell lineage through the simultaneous activation of the IL-7R, c-Kit, sonic hedgehog, Wnt/LEF/T cell factor (TCF), and Notch signaling pathways (1–3). Most current evidence suggests that activation of the Frizzled/LRP6 receptor complex by its cognate ligands (Wnt1–4) regulates survival and proliferation of early thymus immigrants, whereas Notch1 ligation by Delta-like 4 also drives commitment toward the T lineage (4). Acquisition of CD5 by the most immature pro–double-negative (DN)1 human thymocytes (CD34hiCD7++CD1a−) correlates with both the onset of cell proliferation and upregulation of T lineage–affiliated genes (5). Downstream transition from the DN1 (CD34intCD7+CD5+CD1a−) to DN2 (CD34loCD7+CD5+CD1a+) stage coincides with definitive T lineage commitment and initiation of TCRβ D-J rearrangements (6). Subsequently, thymocytes reach the DN3a (CD34−CD4intCD8α−) stage, when they stop proliferating to complete V-DJβ rearrangement, and pass through the β-selection checkpoint to become DN3b thymocytes (CD34−CD4intCD8α+) (3, 7). Later on, post–β-selection DN3b thymocytes further upregulate CD4, acquire expression of CD8β-chain, and reach the double-positive (DP) stage where rearrangement of the TCRα locus takes place. Although most evidence indicates that simultaneous termination of Wnt and Notch signaling plays an important role in DN3a proliferation arrest, the underlying mechanisms remain poorly defined. There is evidence that E proteins (E2A, HEB) play an important role in DN3a proliferation arrest, but whether they interfere with Notch or Wnt signaling has not yet been investigated (8–11). Ikaros/IKZF1 also participate in the process through both induction of CDKN1B/p27KIP1 (12) and interruption of Notch signaling following binding to proximal RBPJ-responsive elements in the HES1 promoter (13–16). The mechanisms of Wnt signaling downmodulation in DN3a thymocytes are less well characterized. It has been shown that a p53-dependent ubiquitin E3 ligase complex involving Siah1, SIP (CacyBP), Skp1, and Ebi promotes β-catenin degradation in pre–β-selection thymocytes (17). However, that SIP-deficient pre–β-selection thymocytes display increased susceptibility to apoptosis does not support the view that this pathway could play an important role in thymocyte proliferation. Consistent with this view, conditional ablation of β-catenin does not affect thymocyte proliferation or differentiation (18, 19). In this study, we identify transmembrane protein 131–like (TMEM131L) as a negative regulator of thymocyte proliferation and provide evidence that it corresponds to a proximal inhibitor of the canonical Wnt pathway with which it interferes through induction of lysosome-dependent degradation of the active phosphorylated form of the LRP6 coreceptor. Full-length TMEM131L coding sequence (CDS) was obtained from the Deutsches Ressourcenzentrum für Genomforschung; long (L) and short (S) isoform CDS were subcloned in frame with the Flag epitope into a pFlag expression vector. LRP6ΔN expression vector was provided by X. He (Harvard Medical School, Boston, MA). Stabilized β-catenin (S33A, S37A, T41A, and S45A) was provided by W. Held (Ludwig Institute for Cancer Research, Lausanne, Switzerland). LRP6-YFP, hAxin1, and hDvl1 constructs were from C. Niehrs (Deutsches Krebsforschungszentrum, Heidelberg, Germany). LRP6 CDS was subcloned in frame with a Myc epitope into a pMyc expression vector. Transient transfection of HeLa and HEK 293T cells was performed as reported (20). Cell extracts were prepared in RIPA buffer, 0.05% SDS (0.05 M Tris [pH 8], 0.2 M NaCl, 1% Nonidet P-40, 0.02 M EDTA [pH 8], 0.5% deoxycholate), subjected to SDS-PAGE, transferred by iBlot (Invitrogen), and probed with Abs to TMEM131L (PC1 rabbit Ab, 3F10 mAb), Flag (Sigma-Aldrich), β-catenin, LRP6, phospho-LRP6 (Ser1490) (all from Cell Signaling Technology), or β-tubulin (Sigma-Aldrich) Abs. Labeling was developed using HRP-conjugated polyclonal Abs (Pierce). Membranes were processed using the chemiluminescence SuperSignal West Femto maximum sensitivity reagent (Thermo Scientific). Transiently transfected HeLa cells grown on coverslips were washed in PBS and fixed and permeabilized for 10 min in PBS, 3% Triton X-100, and 3.7% formaldehyde. Nonadherent cells were plated on poly-l-lysine-coated coverslips, fixed in 2.5% paraformaldehyde, permeabilized in 0.1% Triton X-100, and labeled with Abs to TMEM131L, calnexin, RAB6, RAB11 (all from Santa Cruz Biotechnology), p58k, β-COP (both from Sigma-Aldrich), Axin (Millipore), Lck, p-LRP6 (Ser1490), and cleaved Notch1 intracellular domain (Val1744) (both from Cell Signaling Technology). Labeling was revealed by Alexa Fluor 488– or 594–labeled secondary Abs (Molecular Probes). Slides were counterstained with DAPI and mounted in Vectashield neutral medium. Fluorescence microscopy was performed either with an Axiovert 2000M or with a confocal LSM510 Meta laser microscope (Carl Zeiss MicroImaging). Images from confocal microscopy were deconvoluted with the AutoDeblur software (ImageQuant). Umbilical cord blood and postnatal thymuses, collected according to institutional guidelines, were processed as described (1, 20). Thymocyte populations were purified based on positive or negative selection with an autoMACS system (Miltenyi Biotec) or a FACSAria II cell sorter (BD Biosciences). Phenotypic characterization of postnatal thymocytes was performed by four-step labeling with the anti-TMEM31L 3F10 mAb and appropriate fluorescent Abs. Cells were analyzed with a FACSCanto cytometer (BD Biosciences) and FlowJo software. Screening of TMEM131L-specific short hairpin (sh)RNAs, sh1 (sense, 5′- GCAAGAACTTTCTCGATACAT-3′; loop, TTCAAGAGA; antisense, 5′- ATGTATCGAGAAAGTTCTTGC-3′) and sh2 (sense, 5′-TGAGCAGTGACATCAATG-3′; loop, TTCAAGAGA; antisense, 5′-CATTGATGTCACTGCTCA-3′), production of vesicular stomatitis virus–pseudotyped lentiviral vectors, lentiviral transduction of CD34+ hematopoietic progenitor cells (HPCs), and in vitro lymphoid differentiation assays were performed as described (20). Eight-week-old NOD-scid/γc−/− (NSG) mice (The Jackson Laboratory, Bar Harbor, MI), housed in the pathogen-free animal facility of the Institut Universitaire d’Hématologie, were irradiated with 2.25 Gy 18–24 h before i.v. injection of 1.5 × 105 human CD34+ HPCs exposed to the appropriate lentiviral vectors and sacrificed 4–12 wk later. Bone marrow (BM) and thymus cells were harvested and FACS-analyzed as above. BM cells were labeled with CD45-Alexa Fluor 700 (BioLegend), CD34-Pacific Blue (BioLegend), CD7-PE (BD Biosciences), and CD19-allophycocyanin (BioLegend) mAbs. Thymocytes were labeled with CD34-Pacific Blue, CD7-PE, CD4-allophycocyanin, CD3-allophycocyanin, and TCRαβ-PE (all from BD Biosciences) or CD8-PE-Cy7 (BioLegend) mAbs. The intracellular TCRβ-chain was detected with the TCRβF1-allophycocyanin (Cytognos) mAb and the Cytofix/Cytoperm kit (BD Biosciences). For cell proliferation analysis, mice were injected i.p. with 1 mg BrdU 16 and 10 h before analysis. Cell surface proteins were labeled as above; cells that had incorporated BrdU were detected using a BrdU flow kit (BD Biosciences). Data were analyzed using FlowJo software. HL60 cells transduced with a lentiviral CMV-Luc reporter (Addgene) were injected s.c. in nonirradiated NSG mice. Longitudinal follow-up by in vivo optical imaging for assessing luciferase activity using the IVIS Spectrum bioluminescence-fluorescence optical imaging system (Caliper Life Sciences). Quantification of selected cDNA was performed as described (20). Amplification of mRNAs was performed with the following primer pairs and a LightCycler (Roche Diagnostics). TMEM131L, forward, 5′-GTAAACACAAAACCAGCAC-3′, reverse, 5′-CATACATGTCTGTATTCCCTC-3′; CCND1, forward, 5′-CGTGGCCTCTAAGATGAAGGA-3′, reverse, 5′-CGTGGCCTCTAAGATGAAGGA-3′; CCND2, forward, 5′-GGACATCCAACCCTA-3′, reverse, 5′-CGCACTTCTGTTCCT-3′; AXIN2, forward, 5′-CTGGCTCCAGAAGATCACAAAG-3′, reverse, 5′-ATCTCCTCAAACACCGCTCCA-3′; c-MYC, forward, 5′-TGGAAGAAATTCGAGCTGC-3′, reverse, 5′-TGGTTCACCATGTCTCCTC-3′; HPRT, forward, 5′-CAGAGGGCTACAATGTGATGGC-3′, reverse, 5′- GCTGAGGATTTGGAAAGGGTG-3′. PCR products were detected by the SYBR Green dye (Roche) and quantified with LightCycler software v.3.5.3 (Roche Diagnostics). HEK 293T cells were transfected in six-well plates with ExGen 500 (Euromedex) or FuGENE 6 (Promega). Luciferase assays were performed using Dual-Luciferase (Promega) and the Galacto-Light β-galactosidase (Applied Biosystems) reporter systems. For analysis of the Wnt/β-catenin pathway, HEK 293T cells were cotransfected with TMEM131L, TOPFlash luciferase (M72 Super 16× or M51 Super 8×; both from Addgene), or FOPFlash luciferase (Upstate/Cell Signaling) and the pCS2-(n)-β-gal construct (gift of S. Jauliac). 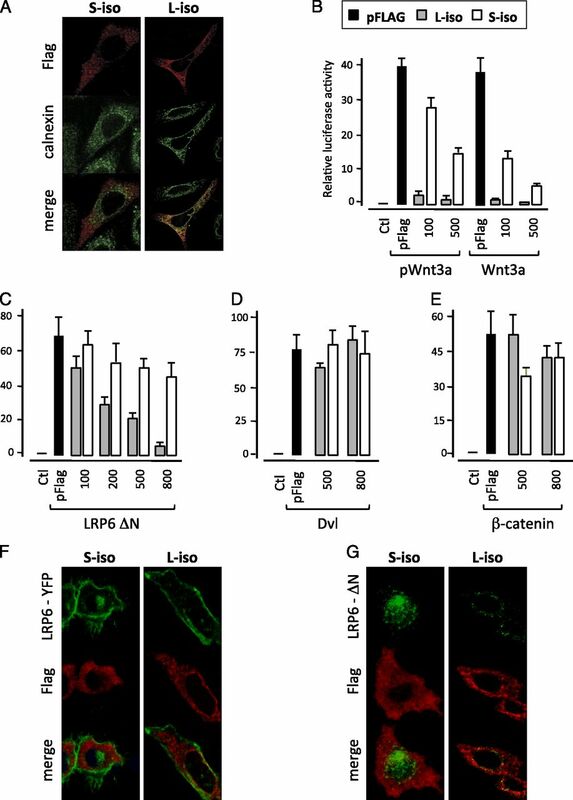 Wnt signaling was activated by cotransfection of pWnt3a, LRP6ΔN, hDvl, or stabilized β-catenin (S33A, S37A, T41A, and S45A (gift of W. Held, Ecole Polytechnique de Lausanne) or by treatment with Wnt3a-conditioned medium (L-Wnt-3A cell line; American Type Culture Collection). After 48 h, luciferase activity was measured, corrected for transfection efficiency as determined by quantification of β-galactosidase activity, and normalized relative to background FOPFlash luciferase activity. Genome-wide transcriptome analysis of postnatal thymocytes identified TMEM131L as a candidate gene possibly involved in pre–β-selection T cell development (20). Located on human chromosome 4q31.3, the KIAA0922/TMEM131L locus has 35 translated exons and two transcription start sites (TSS1-2; Supplemental Fig. 1A). During intrathymic development, TMEM131L transcript levels strongly increase from pro–DN1 thymocytes to DN3a cells, in which they peak, and drop immediately after β-selection in their DN3b successors (Supplemental Fig. 1B, 1C). The KIAA0922/TMEM131L locus codes for two proteins referred to thereafter as the L (1609 aa) and S (1461 aa) isoforms (Supplemental Fig. 1D). The L isoform is a type 1 protein with an N-terminal signal peptide (aa 1–40) and a single putative transmembrane segment (aa 870–890) separating an extracellular (aa 41–869) from an intracytoplasmic domain (aa 891–1609). Although lacking a signal peptide, the S isoform carries a putative N-terminal myristoylation site suggestive of possible association with lipid bilayers. Sequence analysis and orthologous alignments identified three conserved homology domains (CHDs; CHD1, aa 1–176; CHD2, aa 696–916; CHD3, aa 1401–1609) and a C-terminal serine-rich region (aa 1302–1331) (Fig. 1A). To characterize the TMEM131L protein, we used a polyclonal Ab, PC1, that recognizes its cytoplasmic domain, and the 3F10 mAb directed at the extracellular N terminus. Ab specificity was verified by immunoblotting HEK 293T cells transfected with Flag-tagged TMEM131L L or S isoforms. The PC1 and anti-Flag Abs detected both isoforms at the predicted 180- and 160-kDa molecular masses, whereas the 3F10 mAb recognized the L isoform only (Supplemental Fig. 1E, 1F). Both isoforms were present in most lymphoid leukemia cell lines analyzed but remained barely detectable in the granulomacrophagic cell lines, confirming TMEM131L lymphoid affliation (Supplemental Fig. 2A). Notably, the S isoform was expressed at higher levels than the L isoform, suggesting preferential usage of TSS2. Immunofluorescence analysis of Jurkat T cells showed TMEM131L location in discrete punctate structures that did not colocalize with markers of the Golgi (58k, β-COP), the endoplasmic reticulum (ER) (calnexin), early or late endosomes (RAB6, RAB11), or with Axin1, a known intermediate of the Wnt pathway (Supplemental Fig. 2B, 2C). Notably, whereas TMEM131L as detected by 3F10 mAb was confined to the cytoplasm, the PC1 Ab also stained the nucleus. Inasmuch as the L isoform comprises a signal peptide, we next examined its possible expression at the plasma membrane. Indeed, FACS analysis showed surface labeling by 3F10 mAb in most T (SupT1, Jurkat) and B (Daudi, Raji, Ramos) cell lines, but not in granulomonocytic HL60 cells (Supplemental Fig. 2D). Subcellular fractionation of Jurkat cells confirmed these data by showing the selective association of the L isoform with the membrane fraction (Supplemental Fig. 2E). Live cell imaging finally showed that surface TMEM131L distributed in large membrane clusters that did not colocalize with TCR (CD3) or BCR (CD19) components (Supplemental Fig. 2F–H). Dynamics of TMEM131L expression in thymocytes. (A) Schematic representation of TMEM131L L and S isoforms showing signal peptide (SP; aa 1–41; green), transmembrane domain (TM; aa 870–890; red), serine-rich region (SRR; blue), as well as CHD1–3 (blue lines). Regions recognized by the 3F10 mAb or PC1 polyclonal Ab are indicated by arrows. (B) RT-qPCR analysis of umbilical cord blood CD34+ prothymocytes (PT) and CD34+CD1a− (DN1), CD34lo/−CD1a+ (DN2), CD4intCD8− (ISP), CD4+CD8+CD3− (DP3−), CD4+CD8+CD3+ (DP3+), CD4+CD8−CD3+ (SP4+), or CD4−CD8+CD3+ (SP8+) thymocytes. Expression is normalized relative to that in PTs and is expressed as fold changes. Means of three independent samples are shown. (C and D) Immunoblot analysis. (C) Total thymocytes and magnetically purified CD3+, CD3−, and CD3−CD8− cell populations were probed with PC1 or β-tubulin (β-tub) Abs. The 180- and 160-kDa bands are duplicated. Note that only limited quantities of material were available for the minor CD3−CD8− cell fraction (see β-tub lane). (D) Comparison of TMEM131L detection by the PC1 Ab and 3F10 mAb in CD3+ and CD3− thymocytes. The two Abs were successively hybridized on the same nitrocellulose membrane. (E–H) TMEM131L subcellular relocalization in developing thymocytes. (E) DN1, DN2, ISP, DP3−, DP3+, and SP4+/8+ thymocytes were FACS-sorted, fixed, and labeled with PC1 before fluorescence microscopy analysis (original magnification ×40). Arrows indicate stage-specific membrane-associated TMEM131L structures. (F and G) Thymocyte populations were sorted, fixed, and labeled with PC1 and Axin Abs and analyzed by confocal microscopy followed by two-dimensional (E) or three-dimensional (F) reconstruction. TMEM131L and Axin colocalize in polarized crescent-like structures detected at the ISP stage. (H) Confocal microscopy analysis of 3F10 mAb-labeled live ISP and DP CD3+ thymocytes. Note that TMEM131L crescent-like structures preferentially localize in cell-to-cell contact zones. (I and J) TMEM131L stage-specific surface detection in thymocytes. Cells were labeled with 3F10 mAb and the appropriate stage-specific markers (CD34, CD1a, CD3, CD4, CD8) before FACS analysis. Gates were set on (I) total or (J) DN1, DN2, ISP, DP3−/+, or SP4+/8+ thymocyte populations. Analysis was performed with FlowJo software. Quantitative RT-PCR (RT-qPCR) analysis of pre– and post–β-selection thymic populations confirmed the transcriptome data that the TMEM131L locus was repressed immediately after passage through β-selection (Fig. 1B). 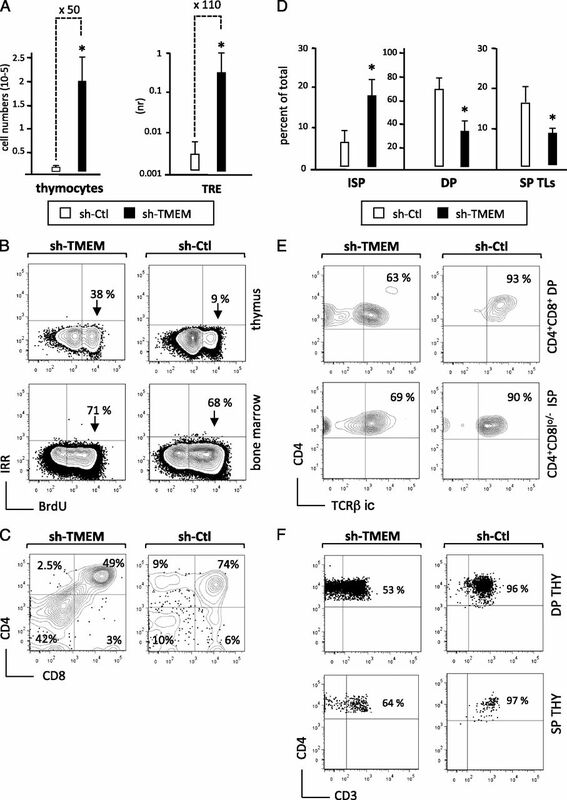 Immunoblotting of bulk and three magnetically purified thymocyte populations showed, as expected, that TMEM131L expression was largely restricted to the most immature CD3−CD8− cells, in which levels of the two isoforms were comparable (Fig. 1C, 1D). Interestingly, in pre–β-selection thymocytes, the corresponding 180- and 160-kDa bands were duplicated, suggesting TMEM131L posttranslational modifications. The PC1 Ab detected a third, lower molecular mass S2 isoform (150 kDa) in the latter cells. Immunofluorescence analysis showed that whereas TMEM131L resided in punctate cytoplasmic structures in DN1 and DN2 cells, it was located into large crescent-shaped membrane structures in DN3 cells (Fig. 1E), indicating that it is submitted to stage-specific positional regulation during early intrathymic development. The TMEM131L+ structures also comprised Axin1, a major component of the β-catenin degradation complex (Fig. 1F, 1G), but did not colocalize with CD4-associated Lck tyrosine kinase (data not shown), which stresses the specificity of their association. Live cell imaging of DN3 thymocytes confirmed that surface TMEM131L+ structures predominantly localized in cell-to-cell contact zones (Fig. 1H). FACS analysis found, as expected, that only 0.5–1% of thymocytes, all of which were CD34−CD1a+, expressed surface TMEM131L (Fig. 1H). In line with TMEM131L expression dynamics during intrathymic development, TMEM131L+ cell percentages increased from ≤5% to ≥60% during the transition from the DN1/DN2 to DN3 stages and rapidly decreased after β-selection (Fig. 1I, 1J). Consequently, only <0.5% of circulating CD3+ T cells displayed membrane TMEM131L (data not shown). These data indicate that during intrathymic development TMEM131L expression is regulated at transcriptional, posttranslational, as well as positional levels. NSG mice were then grafted with CD34+ HPCs transduced with a lentiviral vector producing shRNAs (sh-TMEM) that reduced TMEM131L expression by 60–80% both at the RNA and protein levels (20, 21) (Supplemental Fig. 3A–C). Twelve weeks after graft, BM CD45+GFP+ cell percentages and absolute numbers were 2-fold lower in these mice than in those grafted with control shRNA-transduced HPCs (Supplemental Fig. 3D), indicating that TMEM131L–knocked-down (TMEM131Lkd) cells had slightly reduced engraftment capacity. However, FACS analysis showed that TMEM131L silencing did not modify percentages of BM CD34+lineage− HPCs, CD34+CD19+ pro–B cells, CD34+CD7+ prothymocytes, or CD14+ monocytes, indicating that the protein does not affect multilineage BM hematopoieisis (Supplemental Fig. 3E, 3F). Rather, TMEM131L silencing resulted in a 10- to 40-fold increase in the absolute numbers of 12-wk-postgraft CD45+GFP+ thymocytes, corresponding to a 75- to 200-fold enhancement (median, 110-fold) of thymus reconstitution efficiency (Fig. 2A). Given that TMEM131L silencing did not affect the emergence of BM prothymocytes, we reasoned that this reflected increased proliferation of TMEM131Lkd thymocytes. Analysis of BrdU incorporation showed that, indeed, whereas TMEM131L silencing did not influence BM cell proliferation, it increased CD45+GFP+BrdU+ thymocyte percentages 4-fold irrespective of their pre– or post–β-selection developmental stage (Fig. 2B and data not shown). Notably, long-term follow-up of NSG mice grafted with TMEM131Lkd CD34+ HPCs showed that only few thymocytes remained at month 5 postgraft, suggesting that increased proliferation ultimately leads to abortive intrathymic development (data not shown). Phenotypic characterization of TMEM131Lkd thymocytes showed a 3- to 5-fold increase in pre– or early post–β-selection CD4+CD8−/lo cell percentages as well as a corresponding 2- and 10-fold drop in DP and single-positive (SP) thymocyte percentages, indicative of multistep developmental defects (Fig. 2C, 2D). Consistent with the hyperproliferative phenotype, about a third of CD4+CD8lo/− and DP TMEM131Lkd thymocytes expressed low to undetectable cytoplasmic TCRβ and lacked surface TCRαβ/CD3 (Fig. 2E, 2F), which suggests that hyperproliferation also hampers TCR rearrangement. Notably, TMEM131L silencing did not modify the percentages of intrathymic TCR γδ+ cells (data not shown). TMEM131L silencing affects intrathymic development. NSG mice were injected with 1.5 × 105 human CD34+ HPCs transduced by TMEM131L (sh-TMEM) or scrambled (sh-Ctl) shRNA vectors. After 12 wk, thymocytes were FACS analyzed to determine the extent of CD45+GFP+ cell chimerism and for phenotyping. (A) Enumeration of GFP+CD45+ human cells in the thymus of recipient mice (thymocytes; left panel) and thymus reconstitution efficiency (TRE; right panel), defined as the ratio of GFP+CD45+ cell numbers detected in the thymus versus the BM (transduction efficiency, 25 ± 4%; six mice per condition; data are from one of four experiments). Similar results were obtained with vectors driving expression of sh-TMEM-1 (experiments 1–4) or sh-TMEM2 RNAs. (B) Thymocyte proliferation. Mice were i.p. injected with 1 mg BrdU 16 and 10 h before FACS analysis. (C and D) Intrathymic T cell development. FACS analysis of CD45+GFP+ thymocytes of individual mice at week 12 after graft. (C) CD4 and CD8 labeling. Gating on bulk CD45+GFP+ thymocytes shows that TMEM131 deficiency elicits intrathymic accumulation of developmentally arrested ISP cells. (D) Relative quantification of thymocyte developmental subsets. Data are presented as percentages of CD45+GFP+ thymocyte subpopulations. Means ± SD of eight representative mice from two of four experiments. *p < 0.05 (Student t test). (E and F) TCR expression. (E) Expression of intracytoplasmic TCRβ by CD4+CD8+ DP (upper panel) or CD4+CD8lo/− ISP (lower panel) thymocytes. Cells were labeled as above, fixed, and permeabilized before labeling with an allophycocyanin-conjugated anti-TCRβ mAb. Gates were set on DP CD45+GFP+ cells. Percentages of each population are indicated. (F) Expression of surface TCR/CD3 complexes by post–β-selection DP and mature SP thymocytes. Gates are set on CD4+CD8+ DP or CD4+/−CD8+/− SP thymocytes. CD3+ cell percentages are indicated. That TMEM131L colocalizes with Axin1 in DN3 thymocytes led us to hypothesize that intrathymic hyperproliferation could also result from abnormal Wnt signaling. TMEM131Lkd thymocytes were therefore FACS-sorted from the thymi of mice at 12 wk after graft and analyzed by RT-qPCR (Fig. 3A), which was performed on bulk unfractionated thymocytes due to their limited cell numbers. Consistent with their hyperproliferative phenotype, these thymocytes expressed higher levels of cell-cycle regulators and Wnt target genes c-Myc, CCDN1, CCDN2,and Axin2 (22). Notably, the expression of Wnt receptors (LRP6, Fz7, Fz8) or signaling components (CTNNB, JUP, DVL) did not change (data not shown). To confirm that TMEM131L knockdown actually led to deregulated Wnt signaling, the thymocytes were analyzed by immunofluorescence for active p-LRP6 expression and the presence of intranuclear β-catenin. As expected, a majority stained positive for p-LRP6 and displayed prototypic intranuclear β-catenin foci (23) (Fig. 3B). These data indicate that deregulated Wnt signaling may contribute to the hyperproliferative phenotype of TMEM131L-deficient thymocytes. TMEM131Lkd thymocytes display deregulated Wnt signaling. (A) RT-qPCR analysis of CD45+GFP+ thymocytes from mice grafted with human CD34+ HPCs transduced by TMEM131L shRNA vectors (sh-TMEM)–transduced HPCs. Owing to limited cell numbers, only bulk GFP+ thymocytes were analyzed. Expression is normalized relative to that in thymocytes of mice injected with scrambled shRNA-transduced HPCs and is expressed as fold changes. Means of three independent biological samples are shown. (B) Immunofluorescence analysis of CD45+GFP+ thymocytes of individual mice 12 wk after grafting with CD34+ HPCs transduced by TMEM131L (shTMEM) or scrambled shRNA vectors (sh-Ctl). Fixed and permeabilized cells were labeled with p-LRP6 (upper panel) or β-catenin (lower panel) Abs (original magnification ×40). Consistent with abnormal activation of the canonical Wnt signaling, TMEM131L-deficient thymocytes express LRP6 active phosphorylated form (p-LRP6) and β-catenin is predominantly localized in the nucleus. Inasmuch as these results suggested that TMEM131L might correspond to a novel Wnt signaling antagonist, we sought to determine whether it interfered with the Wnt canonical pathway. Analysis of HeLa cells transfected with either of the TMEM131L isoforms (Fig. 4A) showed, as expected, that the L isoform colocalized with calnexin in the ER, which indicated the functionality of its signal peptide, whereas the S isoform remained scattered throughout the cytoplasm in small-sized punctate structures. In HEK 293T cells cotransfected with a luciferase TCF reporter, L isoform expression strongly inhibited luciferase activity stimulated by either cotransfection of a Wnt3a expression vector or treatment with Wnt3a-conditioned medium (Fig. 4B). In contrast, only marginal inhibition occurred in S isoform–transfected cells, indicating that TMEM131L transmembrane localization is essential for Wnt signaling inhibition. Of note, FACS analysis of transiently transfected HEK 293T cells failed to detect the presence of the TMEM131L L isoform at the cell surface, which suggests that cell type–specific interactants or posttranslational modifications are needed for its export at the plasma membrane (data not shown). Membrane-associated TMEM131L antagonizes Wnt signaling. (A) Subcellular localization of TMEM131L isoforms. HeLa cells were transfected with Flag-tagged S or L isoforms and fixed and stained with Abs to Flag or calnexin. Confocal imaging (original magnification ×40) shows S isoform distribution among cytoplasmic aggregates, whereas the L isoform colocalizes with calnexin in the ER. (B–E) Effect of TMEM131L L or S isoforms on luciferase TCF reporter activity in HEK 293T cells following activation of Wnt signaling by cotransfection (B) with pWnt3a or treatment with Wnt3a-conditioned medium, or with (C) LRP6ΔN, (D) Dvl, or (E) β-catenin (0.2 μg each). Normalized luciferase activities of the TCF/β-catenin reporter TOPFlash are reported as arbitrary units, with the control (transfection with empty vector) being defined as 1. Means ± SD of triplicate wells from one of three experiments. (F and G) Confocal microscopy analysis of HeLa cells transfected with Flag-tagged TMEM131L isoforms and (F) LRP6-YFP or (G) constitutively active LRP6ΔN. Cells were fixed and stained with Abs to Flag or p-LRP6 48 h after transfection (images were obtained as above; original magnification ×40). Cotransfection with the L isoform abrogates LRP6ΔN detection. To decipher the level at which TMEM131L interferes with canonical Wnt signaling, we examined its effect on luciferase TCF reporter activity following stimulation by a constitutively active truncated form of LRP6 (LRP6ΔN) (24) or by downstream cytoplasmic components of the Wnt axis, Dvl or β-catenin (25). The LRP6ΔN construct full description may be found in Tamai et al. (24). Whereas the L isoform strongly inhibited the reporter activity stimulated by LRP6ΔN (Fig. 4C), neither isoform inhibited Wnt signaling activated by Dvl or β-catenin (Fig. 4D, 4E), indicating that TMEM131L neither interfered with Dvl-mediated recruitment of the β-catenin destruction complex nor did it affect β-catenin nuclear translocation or transcription regulatory activity. Cotransfection of U2OS cells with a Notch reporter gene (RBPJ luciferase) and the L or S isoforms showed that neither affected luciferase activity stimulated by a constitutively cleaved truncated form of Notch1 (NotchΔE) or by NICD, which underscores the specificity of TMEM131L interactions with the Wnt pathway (data not shown). Accordingly, neither isoform interfered with TNF-α or TGF-β signaling in appropriate reporter assays (data not shown). We next investigated whether TMEM131L interfered with LRP6 expression or subcellular distribution. Cotransfection of Flag-tagged TMEM131L isoforms with LRP6-YFP did not affect LRP6-YFP subcellular localization, predominantly beneath the plasma membrane (Fig. 4F). In line with the luciferase data, whereas the S isoform did not affect LRP6ΔN perinuclear localization (26, 27), the L isoform expression almost abrogated LRP6ΔN labeling (Fig. 4G). Consistent with these findings, stimulation with Wnt3a-conditioned medium of HeLa cells transiently transfected with the L isoform also led to both decreased expression and enhanced perinuclear accumulation of LRP6-YFP (data not shown). Immunoblotting confirmed these results by showing that whereas membrane-associated TMEM131L did not affect basal LRP6 expression in cotransfected HEK 293T cells, it elicited almost complete degradation of LRP6ΔN, the expression of which was only marginally altered by the S isoform (Fig. 5A, 5B). As expected, neither isoform interfered with β-catenin expression, showing the specificity of this effect (Fig. 5C). We then examined the effect of membrane-associated TMEM131L on endogenous LRP6 in Wnt3a-treated HEK 293T cells (Fig. 5D). 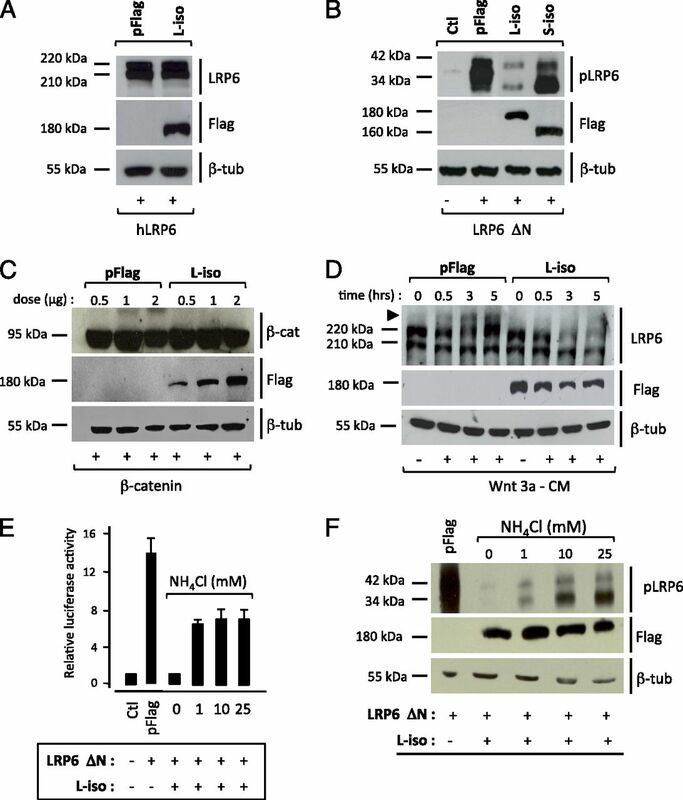 Kinetic assays showed that, indeed, the L isoform not only prevented p-LRP6 appearance but also enabled degradation of low–molecular mass LRP6 species. Because LRP6 can be internalized in a clathrin-dependent manner (28, 29), we speculated that TMEM131L-induced degradation of p-LRP6 could depend on the lysosomal system. Treatment with NH4Cl, which inhibits lysosomal protein degradation, but not with proteasome inhibitors lactacystin or MG132 (data not shown), both restored luciferase activity and antagonized TMEM131L-mediated LRP6ΔN degradation in the cotransfected cells (Fig. 5E, 5F). Membrane-associated TMEM131L triggers p-LRP6 degradation. (A–C) HEK 293T cells were cotransfected with vectors encoding Flag-tagged TMEM131L isoforms and (A) hLRP6 (1 μg each), (B) constitutively active truncated LRP6ΔN, or (C) stabilized β-catenin (0.5 μg each). Whole-cell extracts were immunoblotted 48 h later using Abs to Flag, LRP6, p-LRP6, β-catenin, or β-tubulin. (D) Effect of membrane-associated TMEM131L on endogenous LRP6. HEK 293T cells transfected as above with Flag-tagged L isoform were cultured for 48 h. Wnt signaling was activated by adding Wnt3a-conditioned medium at the indicated time points. Whole-cell extracts were immunoblotted with appropriate Abs; the arrow indicates p-LRP6. (E and F) TMEM131L induces p-LRP6 lysosome-dependent degradation. HEK 293T cells cotransfected with the TMEM131L L isoform, LRP6ΔN, and the TCF/β-catenin reporter TOPFlash were treated with graded doses of NH4Cl. Whole-cell extracts were assayed for (E) luciferase activity or (F) immunoblotted with Abs to Flag, p-LRP6, or β-tubulin. Thus, membrane-associated TMEM131L antagonizes canonical Wnt signaling by triggering lysosome-dependent degradation of p-LRP6. To determine whether Wnt inhibition depends on TMEM131L signaling, we used a truncated form of TMEM131L that lacks most of the intracellular domain (aa 1:920, referred to as the extracellular domain [ECD]) and a reciprocal membrane-anchored version of its cytoplasmic part (membrane-anchored intracellular domain [MA-ICD], aa 1–40/870–1609) (Fig. 6A, left panel). Transient expression assays showed that the two forms had the expected molecular mass (ECD, 101 kDa; MA-ICD, 87 kDa) and located in the ER (Supplemental Fig. 4). When tested in luciferase TCF reporter assays, only the ECD construct antagonized Wnt signaling, leading to dose-dependent inhibition of the luciferase reporter activity as well as to almost complete LRP6ΔN degradation (Fig. 6B, 6C). That the MA-ICD construct displayed only marginal activity in this context demonstrates that TMEM131L-mediated inhibition of the Wnt pathway does not depend on its intrinsic signaling activity. That LRP6ΔN construct comprises only a limited portion of its juxta-membrane domain (aa 1370–1613) (24) led us to hypothesize that TMEM131L-mediated inhibition of Wnt signaling could depend on the membrane-proximal extracellular CHD2 domain. Transfection of HEK 293T cells with a membrane-anchored derivative of CHD2 showed, as expected, robust inhibition of luciferase activity stimulated by LRP6ΔN (Fig. 6D). Consistent with these data, the membrane-anchored CHD2 construct also elicited dose-dependent LRP6ΔN degradation in cotransfected HEK 293T cells, although less efficiently than did the ECD construct (Fig. 6E). Degradation of p-LRP6 depends on the TMEM131L extracellular domain. (A) Schematic representation of membrane-associated (MA)-ECD and MA-ICD (left panel), and MA-JMD (right panel) constructs. 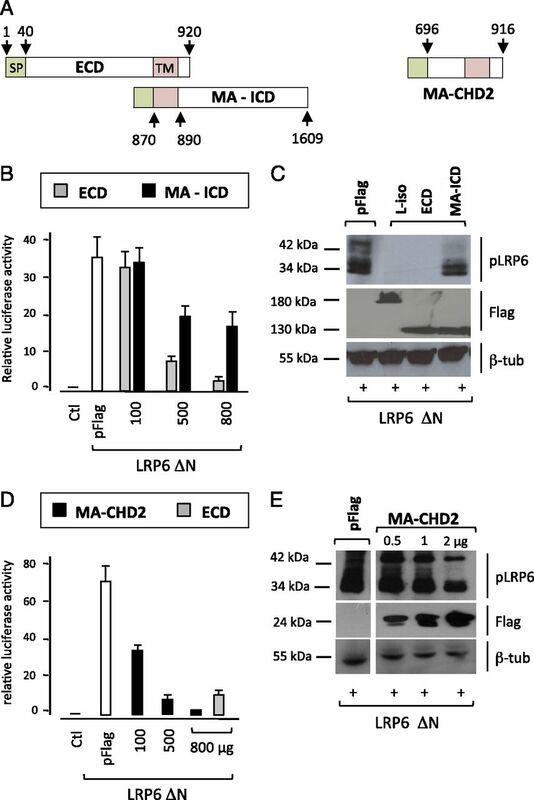 (B and C) Effect of ECD or MA-ICD proteins on LRP6ΔN-activated Wnt/β-catenin signaling. Cell transfections, (B) luciferase reporter assays, and (C) immunoblots were performed as indicated in Fig. 5. (D and E) Effect of MA-JMD on LRP6ΔN-activated Wnt/β-catenin signaling. HEK 293T cells were transfected with the corresponding constructs at the indicated doses. Luciferase reporter assays and immunoblots were performed as indicated above. To further document the interaction between TMEM131L and Wnt signaling, we used HL60 cells, which express barely detectable endogenous TMEM131L (see Supplemental Fig. 2A) and depend on Wnt/β-catenin signaling for in vivo expansion in immunodeficient mice (30). The cells were doubly transduced with lentiviral vectors driving ECD or MA-ICD expression and a constitutively active luciferase reporter, before being s.c. injected into NSG mice. Longitudinal monitoring of tumor development based on luciferase signal intensity showed that only the ECD (but not the MA-ICD) construct limited tumor growth during a 3-wk observation period (Fig. 7A). 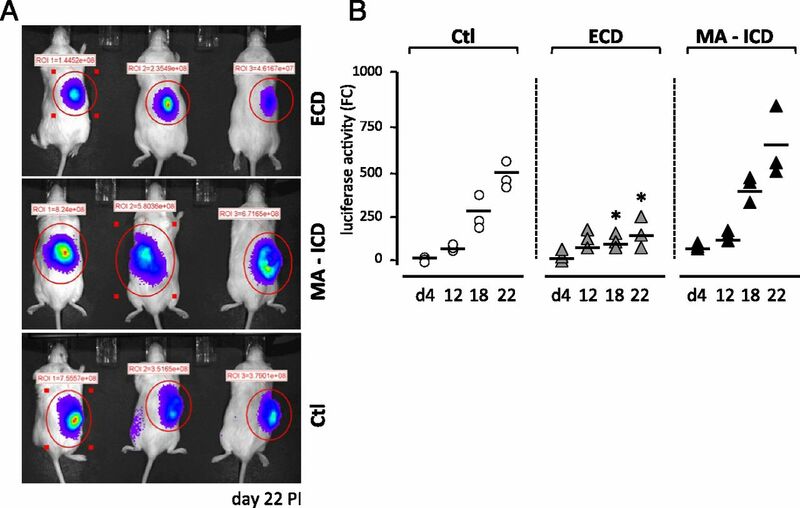 Between day 18 and 22 after injection a 4- to 7-fold decrease in total luciferase activity was noted in mice grafted with ECD-transduced HL60 cells relative to the control or MA-ICD conditions (Fig. 7B). Surprisingly, the MA-ICD construct did not limit tumor growth and even exerted a weak stimulatory effect in recipient mice. Collectively, these results identify TMEM131L as a novel antagonist of canonical Wnt signaling and suggest that its stage-specific membrane translocation in DN3 thymocytes may contribute to limit pre–β-selection thymocyte proliferation. TMEM131L extracellular domain inhibits Wnt signaling in vivo. Longitudinal quantitative analysis of bioluminescence imaging (BLI). NSG mice were injected s.c. with 1 × 106 HL-60 cells doubly transduced with a luciferase reporter and TMEM131L ECD or MA-ICD constructs. (A) Representative dorsal views of NSG mice at day 22. The optical signal is expressed as photons per second per square centimeter of body surface analyzed. (B) Relative BLI signal fold changes from day 4 to day 22 after injection. *p < 0.05 for ECD versus control or MA-ICD versus control (Student t test). Wnt signaling plays a key role in thymocyte proliferation and survival (31). In the mouse, Wnt family members are abundantly expressed in the thymus, and ablation of Wnt1, Wnt3a, or Wnt4 (32, 33), or transgenic expression of Wnt antagonists Dkk1, Kremen (23, 34, 35), or soluble Frizzled receptors (36), decrease thymocyte proliferation and lead to pre–β-selection intrathymic differentiation arrest. Similarly, transgenic expression of Axin1 (37) or ICAT (38) or conditional ablation of HMG box transcription factors LEF1/TCF7 (39–41) both arrest intrathymic development prior to, or immediately after, β-selection. The role of the β-catenin coactivator in thymocyte proliferation and differentiation is more controversial. Although it has been shown that immature thymocytes display intranuclear β-catenin (23) and that β-catenin conditional stabilization allows thymocytes to bypass the requirement for pre-TCR signaling to reach the DP stage, neither β-catenin ablation nor β- and γ-catenin combined absence affects intrathymic development (18, 19). One possible explanation is that a still undefined alternate β-catenin–independent noncanonical pathway regulates intrathymic LEF1/TCF7 activity. As reported for Notch1 (42), Wnt signaling undergoes important stage-specific fluctuations during intrathymic development. Reports based on in vivo assessment of TCF reporter activity or β-catenin transgenic expression in developing thymocytes have provided evidence that, during intrathymic development, Wnt signaling follows a biphasic dynamics with peak levels corresponding to pre– and post–β-selection cell proliferation. Consistent with this view, Wnt signaling reaches maximum levels in DN1 and DN2 thymocytes (23), ceases in DN3 thymocytes (17), re-increases in pre-TCR expressing thymocytes, and ends in post–β-selection CD4+CD8+ early DP thymocytes (43, 44). Thus, during Tαβ lymphocyte development, cessation of Wnt signaling coincides with the two successive phases of TCR rearrangement. Whereas most current evidence indicates that Wnt inhibition in post–β-selection thymocytes relates to downmodulation of pre-TCR signals, the mechanisms that dampen Wnt signaling in DN3a thymocytes remain poorly defined. In this study, we identify TMEM131L as a previously unreported negative regulator of thymocyte proliferation, and we provide evidence that the protein acts through mixed Wnt-dependent and -independent mechanisms. The KIAA0922/TMEM131L locus codes for two major protein isoforms, that is, the L and S isoforms, which differ as to their subcellular localization. Whereas both isoforms are detected among cytoplasmic granular structures, only the L isoform bearing an N-terminal signal peptide corresponds to a prototypic type 1 transmembrane protein and is exported at the cell surface. During human thymopoiesis, TMEM131L undergoes stage-specific surface translocation in DN3 thymocytes where it assembles in crescent-shaped membrane structures that also comprise Axin, a major component of the β-catenin degradation complex. This led us to hypothesize that TMEM131L could participate in proliferation arrest, possibly by interacting with the Wnt pathway. Phenotypic characterization of NSG mice grafted with TMEM131Lkd CD34+ HPCs showed that such was the case. Whereas TMEM131L silencing did not interfere with xenogeneic hematopoiesis or B cell development in the BM, it resulted in a complex thymic phenotype characterized by enhanced thymocyte proliferation, leading to significant increase in thymic cellularity, as well as to multistage developmental arrest. Consistent with intracellular TCRβ-decreased expression, a significant fraction of CD4intCD8lo/− TMEM131Lkd thymocytes remained stuck between the pre– and early post–β-selection developmental stages, and about half of the post–β-selection DP TMEM131Lkd thymocytes lacked surface TCR/CD3 and failed to differentiate into mature SP T lymphocytes. Interestingly, TMEM131L silencing generated an even more severe phenotype in fetal thymic organ culture assays, in which most ex vivo–generated thymocytes were arrested before the DP stage (V. Parietti, unpublished results). Consistent with their hyperproliferative phenotype, TMEM131Lkd thymocytes expressed increased levels of Wnt target genes c-Myc, CCND1, CCDN2, and Axin2. That TMEM131Lkd thymocytes also displayed intranuclear foci of stabilized β-catenin and expressed the active phosphorylated form of the LRP6 coreceptor confirmed the deregulation of Wnt signaling, raising thus the hypothesis that TMEM131L could correspond to an antagonist of the Wnt pathway. Consistent with this view, the membrane-associated TMEM131L L isoform selectively interfered with proximal Wnt signaling by inducing lysosome-dependent degradation of active phosphorylated LRP6. Surprisingly, TMEM1311L-mediated inhibition of Wnt was dependent on membrane-proximal CHD2 domain sharing close homology with the TMEM131 protein, which suggests that both proteins might behave as Wnt antagonists. Given that TMEM131L-mediated degradation of p-LRP6 depends on lysosomes, and because it has been shown that CKII-mediated phosphorylation at Ser1579 shunts LRP6 endocytosis toward a clathrin-dependent inhibitory pathway (28), one may also speculate that TMEM131L perturbs LRP6 intracellular trafficking. Of note, we failed by coimmunoprecipitation to detect TMEM131L direct physical interaction with p-LRP6 (N. Maharzi, unpublished observations). Thus, the precise mechanism by which TMEM131L promotes p-LRP6 degradation remains to be determined. That TMEM131L cytoplasmic domain is not required for p-LRP6 degradation also suggests that its function largely exceeds Wnt inhibition. In line with this idea, we have recently shown that the MA-ICD construct modulates expression of a wide array of lymphoid lineage-affiliated genes upon transfer in CD34+ HPCs (N. Maharzi, unpublished observations). In conclusion, the data presented in this study identify TMEM131L both as a previously unknown regulator of intrathymic proliferation and differentiation, as well as a novel antagonist of the Wnt pathway. Our working model is that transcriptional activation of the TMEM131L/KIAA0922 locus in early thymic immigrants leads to cytoplasmic accumulation of the protein until the DN3 stage. At that time, TMEM131L translocates to the cell surface where it assembles in large clusters and becomes functionally active in regulating thymocyte proliferation and/or differentiation through mixed Wnt-dependent and -independent mechanisms. We are most grateful to D. Trono (Ecole Polytechnique Fédérale, Lausanne, Switzerland) for providing the lentiviral vectors. We thank J. Larghero (Banque de Sang Placentaire, Hôpital Saint Louis, Paris, France) and G. Katz (Fondation Générale de Santé, Paris, France) for providing umbilical cord blood. For providing reagents and advice, we are grateful to X. He (Harvard Medical School, Boston, MA), C. Niehrs (Deutsches Krebsforschungszentrum, Heidelberg, Germany), S. Jauliac (Centre National de la Recherche Scientifique Unité Mixte de Recherche 7212 and INSERM Unité 940, Institut Universitaire d’Hématologie, Paris, France), W. Held (Ecole Polytechnique de Lausanne, Lausanne, Switzerland), C. Brou (Institut Pasteur, Paris, France), B. Kopan (Washington University School of Medicine, St. Louis, MO), M. Li-Weber (German Cancer Research Center, Heidelberg, Germany), S. Cohen (Institute of Molecular and Cellular Biology, Singapore), H. Bellen (Baylor College of Medicine, Houston, TX), and M. Goodhardt and X. Carnec (Institut Universitaire d’Hématologie, Paris, France). This work was supported by INSERM, the Association pour la Recherche contre le Cancer, the Comité de Paris de la Ligue Nationale contre le Cancer, and by the Ecole Pratique des Hautes Etudes.
. 2006. Dynamics of thymus-colonizing cells during human development. Immunity 24: 217–230.
. 2005. Regulation of lymphoid development, differentiation, and function by the Notch pathway. Annu. Rev. Immunol. 23: 945–974.
. 2005. New insights on human T cell development by quantitative T cell receptor gene rearrangement studies and gene expression profiling. J. Exp. Med. 201: 1715–1723. 2002. Development of αβ T cells in the human thymus. Nat. Rev. Immunol. 2: 760–772.
. 1999. Disruption of αβ but not of γδ T cell development by overexpression of the helix-loop-helix protein Id3 in committed T cell progenitors. EMBO J. 18: 2793–2802.
. 1999. TCR gene rearrangements and expression of the pre-T cell receptor complex during human T-cell differentiation. Blood 93: 3033–3043.
. 2007. Regulation of T cell receptor β gene rearrangements and allelic exclusion by the helix-loop-helix protein, E47. Immunity 27: 871–884.
. 1997. E2A deficiency leads to abnormalities in αβ T-cell development and to rapid development of T-cell lymphomas. Mol. Cell. Biol. 17: 4782–4791.
. 2004. E2A proteins enforce a proliferation checkpoint in developing thymocytes. EMBO J. 23: 202–211.
. 2007. E2A and HEB are required to block thymocyte proliferation prior to pre-TCR expression. J. Immunol. 178: 5717–5726.
. 2005. Ikaros induces quiescence and T-cell differentiation in a leukemia cell line. Mol. Cell. Biol. 25: 1645–1654.
. 2003. Perturbation of Ikaros isoform selection by MLV integration is a cooperative event in NotchIC-induced T cell leukemogenesis. Cancer Cell 3: 551–564.
. 2006. Notch activation is an early and critical event during T-cell leukemogenesis in Ikaros-deficient mice. Mol. Cell. Biol. 26: 209–220.
. 2008. Ikaros represses the transcriptional response to Notch signaling in T-cell development. Mol. Cell. Biol. 28: 7465–7475.
. 1995. A dominant mutation in the Ikaros gene leads to rapid development of leukemia and lymphoma. Cell 83: 289–299.
. 2006. Critical function for SIP, a ubiquitin E3 ligase component of the β-catenin degradation pathway, for thymocyte development and G1 checkpoint. Immunity 24: 29–39.
. 2004. β-catenin is dispensable for hematopoiesis and lymphopoiesis. J. Exp. Med. 199: 221–229.
. 2008. Long-term, multilineage hematopoiesis occurs in the combined absence of β-catenin and γ-catenin. Blood 111: 142–149.
. 2011. AF1q/MLLT11 regulates the emergence of human prothymocytes through cooperative interaction with the Notch signaling pathway. Blood 118: 1784–1796.
. 2012. Dynamics of human prothymocytes and xenogeneic thymopoiesis in hematopoietic stem cell-engrafted nonobese diabetic-SCID/IL-2rγnull mice. J. Immunol. 189: 1648–1660.
. 2012. Wnt signaling through inhibition of β-catenin degradation in an intact Axin1 complex. Cell 149: 1245–1256.
. 2006. Wnt signaling in the thymus is regulated by differential expression of intracellular signaling molecules. Proc. Natl. Acad. Sci. USA 103: 3322–3326.
. 2004. A mechanism for Wnt coreceptor activation. Mol. Cell 13: 149–156. 2012. The complex world of WNT receptor signalling. Nat. Rev. Mol. Cell Biol. 13: 767–779.
. 2010. Requirement of prorenin receptor and vacuolar H+-ATPase-mediated acidification for Wnt signaling. Science 327: 459–463.
. 2006. Caveolin is necessary for Wnt-3a-dependent internalization of LRP6 and accumulation of β-catenin. Dev. Cell 11: 213–223.
. 2012. Disabled-2 (Dab2) inhibits Wnt/β-catenin signalling by binding LRP6 and promoting its internalization through clathrin. EMBO J. 31: 2336–2349.
. 2008. Wnt3a and Dkk1 regulate distinct internalization pathways of LRP6 to tune the activation of β-catenin signaling. Dev. Cell 15: 37–48.
. 2011. Heterogeneous sensitivity of human acute myeloid leukemia to β-catenin down-modulation. Leukemia 25: 770–780.
. 2002. Wnt-1 and Wnt-4 regulate thymic cellularity. Eur. J. Immunol. 32: 967–971.
. 2009. Wnt3a deficiency irreversibly impairs hematopoietic stem cell self-renewal and leads to defects in progenitor cell differentiation. Blood 113: 546–554.
. 2006. The Wnt signaling antagonist Kremen1 is required for development of thymic architecture. Clin. Dev. Immunol. 13: 299–319.
. 2010. DKK1 mediated inhibition of Wnt signaling in postnatal mice leads to loss of TEC progenitors and thymic degeneration. PLoS ONE 5: e9062.
. 2001. Wnt signaling is required for thymocyte development and activates Tcf-1 mediated transcription. Eur. J. Immunol. 31: 285–293.
. 2001. Impaired mammary gland and lymphoid development caused by inducible expression of Axin in transgenic mice. J. Cell Biol. 155: 1055–1064.
. 2006. Overexpression of ICAT highlights a role for catenin-mediated canonical Wnt signalling in early T cell development. Eur. J. Immunol. 36: 2376–2383.
. 1998. Redundant regulation of T cell differentiation and TCRα gene expression by the transcription factors LEF-1 and TCF-1. Immunity 8: 11–20.
. 1998. Critical involvement of Tcf-1 in expansion of thymocytes. J. Immunol. 161: 3984–3991.
. 1995. An HMG-box-containing T-cell factor required for thymocyte differentiation. Nature 374: 70–74.
. 2011. Mechanisms of T cell development and transformation. Annu. Rev. Cell Dev. Biol. 27: 539–562.
. 2009. Sustained expression of pre-TCR induced β-catenin in post-β-selection thymocytes blocks T cell development. J. Immunol. 182: 759–765.
. 2009. Pre-TCR-induced β-catenin facilitates traversal through β-selection. J. Immunol. 182: 751–758.